We had to prepare a summer orientation issue for incoming freshmen. 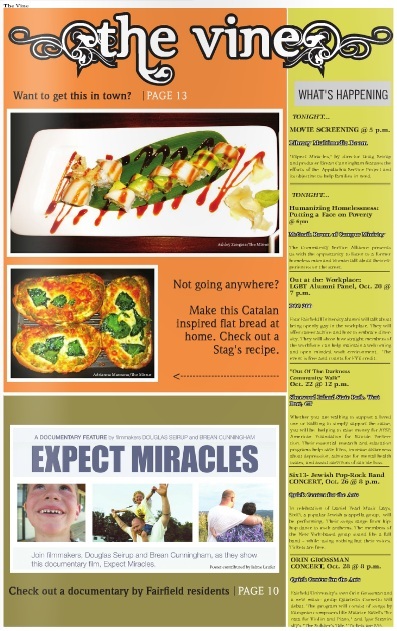 We always use our centerfold to make an eye-catching illustration or graphic. 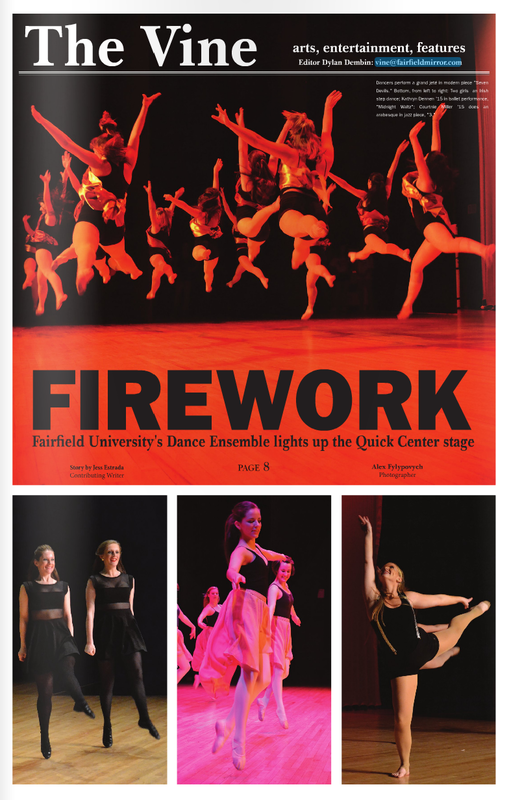 Luigi DiMeglio, the managing editor, and I came up with the idea of having a desk that’s packed with items – each representing an aspect of Fairfield life. 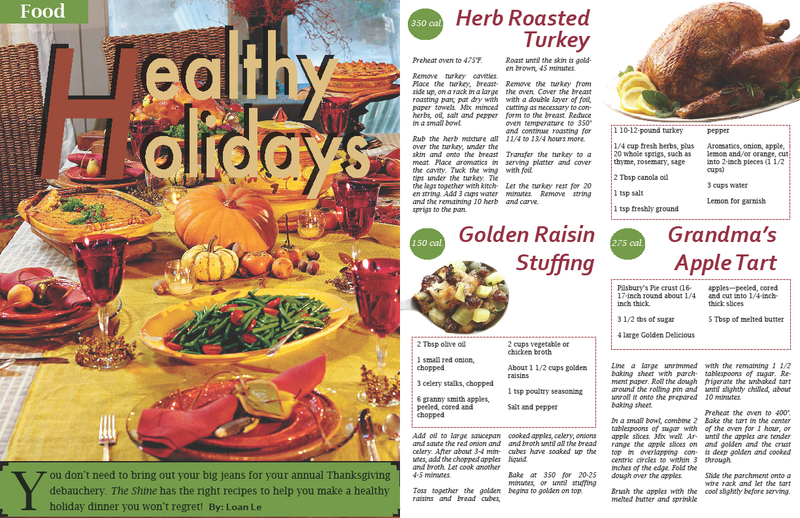 I had so much fun with this one and really tested out my skills in Photoshop and InDesign. I wanted a hyper-realistic quality so I amped up the contrast in the photos. I created my own post-its, adding shadows underneath. I used my iPhone to take a shot of my StagCard, the coins, and the soda can. I’m surprised it turned out all right! Needless to say, I am very proud of this spread. And I hope you like it, too! The girls of the Dance Ensemble work so hard all year and everything comes together in the final showcase. The pictures were astounding – taken by a photojournalism student – so I wanted to highlight the action in all of the pictures. The dominant photo spoke a lot about the amount of talent and precision these girls put into their dance. I thought the showcase’s title, “Firework,” reflected the motion of the picture. A Fairfield University junior was beginning a baking startup and I did a short feature on her. Her pictures were all shot by an iPhone and had great quality, so I wanted to highlight those photos. I thought the largest photo on top would provide enough space for an overlay, and I think it turned out well! A design assignment for Dr. Tommy Xie. Photographic spread of damages in Fairfield, Conn. from Hurricane Sandy. Photo credits to Nicholas DiFazio/The Mirror and local photographer Chris Russo, whose family are long-time residents of the Beach Area. This was the last issue for The Mirror. I wrote the front page story about Fairfield University faculty and administration disagreement over salary and budgets. 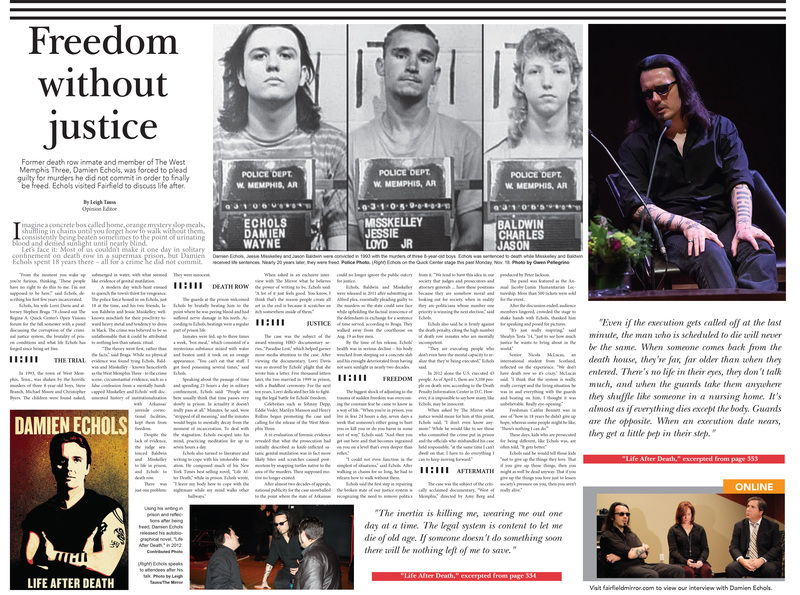 I had a lot of fun putting the story together because I had great help from faculty members. Vincent Ferrer, the cartoonist, drew the ‘95%’ in a crumbling fashion to represent how the administration had broken its promise about maintaining that 95th percentile standard for faculty’s compensation. One of our writers was able to attend the Emerge! fashion show in NYC during New York Fashion Week. I tapped Tebben Lopez to draw the cover and gave me this within a day. Amazing and reliable person. She did a wonderful job! The feature story was about Evan Barden and his project called One Hundred Dates. Barden, a Fairfield ’08 grad, is going to try to go on 100 dates within a year. He then posts his dates on his blog. He is quite a funny and quirky character, and I wanted to have the cover reflect that in some ways. One of my assistant editors Kelsey Guerin wrote a deadline story on him in record time, so she should also be applauded for her efforts. In the beginning, I included only women in the photo illustration, but I read that Barden is more than glad to go on a ‘Gay Date,’ so I added a few men in the crowd. See if you can spot them. All in all, I am extremely proud of my efforts for this week’s cover illustration. I love cupcakes, so during winter break, I looked up cupcake bakeries in Fairfield. I found one called Pink Cupcake Shack, and I never heard of it before. Turns out that the shop just changed its name from Pink Sprinkles Cupcake to Pink Cupcake Shack because a company in California had sued them. Well, that was an interesting story! The company that sued is owned by one of the judges on Cupcake Wars, a competition show on Food Network. I wanted to write about the effect of the lawsuit and how the Shack was now, after changing its name. I played with the whole “Cupcake Wars” thing and this is my product! 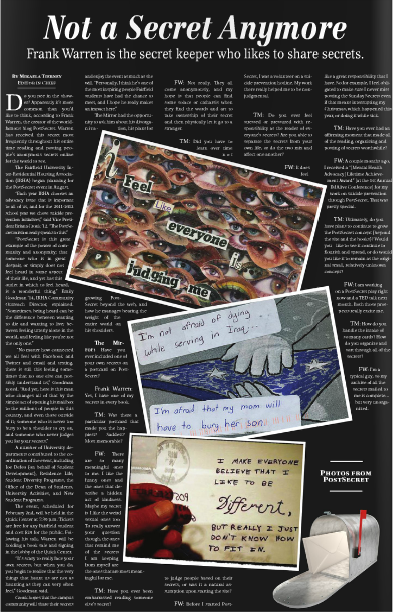 The main story was on Frank Warren, the founder of PostSecret. I thought I’d be cheeky and do a postcard for the front cover. I took a risk by putting it sideways, but I think people like it, from what I hear. The second page I had fun with too. 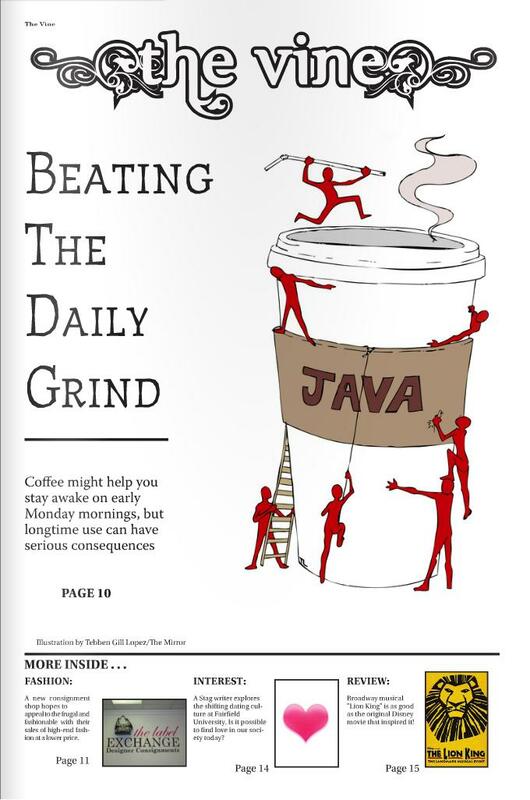 A student wrote a feature story focusing on the coffee drinking culture of Fairfield University. Illustration can be credited to the brilliant Tebben Gill Lopez, who drew this a day after I requested the image! Great illustrator. 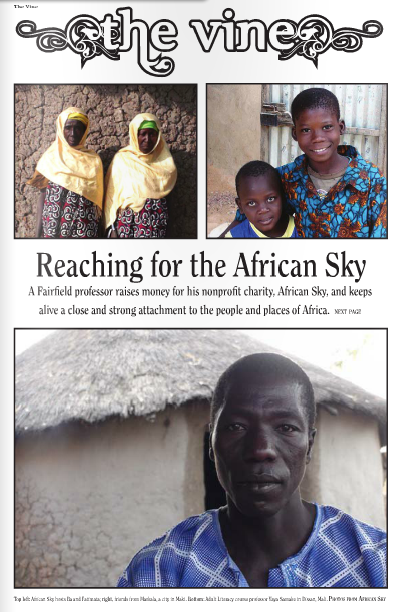 Cover for feature story about a professor’s dedication to African Sky, a nonprofit charity that helps people in Mali, Africa build housings, education systems, and other basic needs. 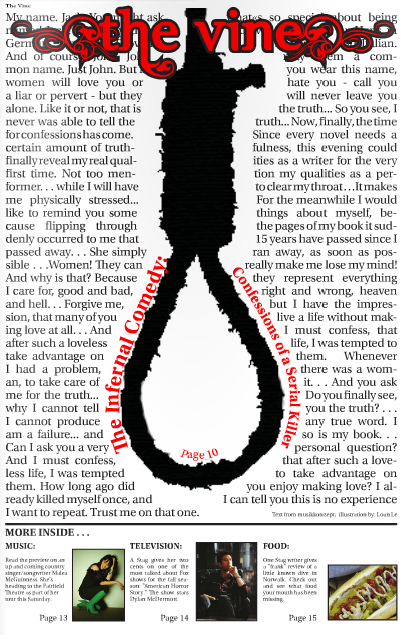 The editor-in-chief wrote a great review and coverage of actor John Malkovich’s performance of “The Infernal Comedy: Confessions of a Serial Killer” at Fairfield University. I tried to be as creative as possible with this one. A Spanish Flamenco group performed at Fairfield University. 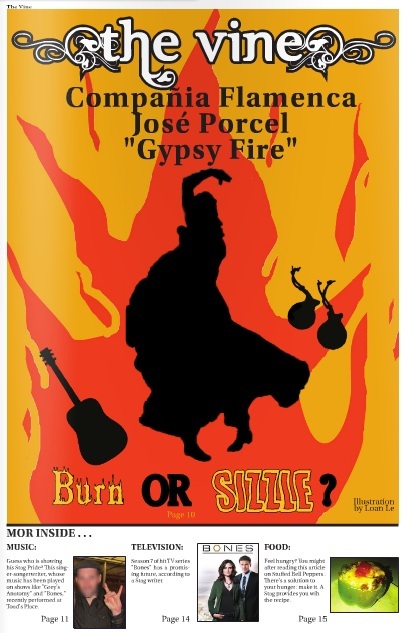 A writer wrote a review that was wholly negative, so I decided to tease the audience with the burn and sizzle question. I had a lot of fun with this one, and I like everything, except for that one mistake that the editors managed to miss! I couldn’t decide on one cover, because we had really good stories that week. 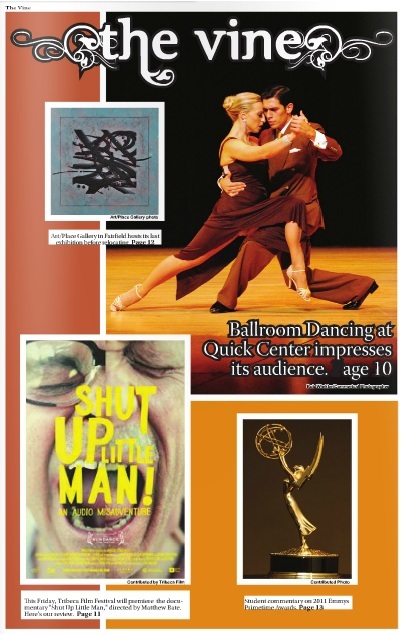 On the right, I was experimenting with a calendar of arts events going on and off campus, but I have since moved it to the back page of The Vine. I was experimenting during this time–couldn’t find one focus, but I still liked this layout. The picture on the right hand corner is my favorite–a really good shot of an excellent show.